New Mexican terra cotta patio adorns Bearidise! Bearidise has a beautiful new patio crafted from handmade Mexican terra cotta tiles, adjacent to our Gothic wedding chapel. The tiles were donated to Bearidise last year and include unglazed and blue glazed styles. Sample tiles were left out over the winter and survived the freezing cycles, thereby clearing the material for year-round use. I counted the tiles in preparation for the design work and found I had about 132 tiles plus a couple with chips. 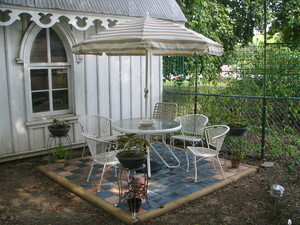 I then researched methods of containment and elevation of the patio that resulted in the selection of landscaping ties. The ties were 8 feet long and 4 inches wide, so arranging the ties in a box created an area of 96 x 88 inches, or 8448 square inches. The tiles are 7-1/2 inches square, and with a half inch for a joint makes 8 x 8, times 132 tiles ... equaled 8448. Hmm. OK, it may not be an epiphany but it did put a spring in my step. 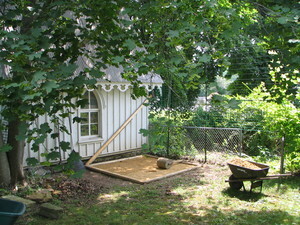 A day in June was consumed working to bring the target area to a rough level, with considerable effort expended in removing roots from the adjacent maple tree. I finally had to get the chainsaw out to remove some of the larger ones. I bought the 4 landscape ties at 84 Lumber and hauled them back to the mansion through the roof of the Lexus! I drilled 3 holes in each of the 4 ties and spent another day bringing the ties to a 3 degree grade away from the building. 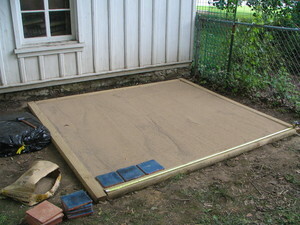 Once I was satisfied with the foundation I pinned them in place using 2 foot rebar rods, coaxed with a 20lb sledgehammer. Next came moving wheelbarrow loads of left over 2RC "grit", which formed the foundation for the gravel parking lots, to the now contained area. The grit needed to be thoroughly compressed in order to make a good foundation for the tile, and renting a vibrating compactor was prohibitively expensive, so I dug out a 100lb concrete roller which, for reasons mercifully forgotten, has been drug around the country since the early 1970's when my father purchased it somewhere. The roller required a new handle to be operable, so I spent another hour and a half fashioning a new one, and into service it went. I also made a screet out of a straight 2x4 and a 2x2 that I cut to the proper depth for leveling the 2RC as it was compacted. It took quite a few trips to fill up the 2-1/2 inches or so that was required. The last inch or so of the 2RC was quite annoying because the small gravel pieces in the material made screeting very difficult and I finally realized I was going to have to sift the material ... oh joy. I came upon an old steel wastecan that had the diamond-shaped open mesh, and it proved to be a perfect sieve for the 2RC! I did about two wheelbarrow loads through the seive to get the finer material to top off the base layers. 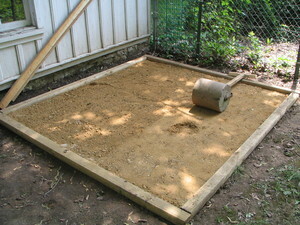 After the 2RC was well compacted I purchased 490 pounds of sand for the setting bed for the tiles. Since this was at a different depth, I adjusted the screet for the new material and used all but a few pounds. The final layer of sand was not compressed because I needed some play to compensate for some of the tiles, which are far from uniformly flat. Tile ready for Polymetric Sand. Recognize the design? Finally it was time to set the tile. 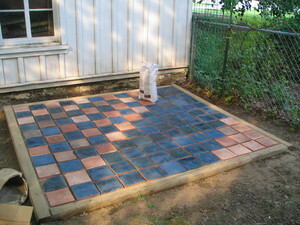 I used two 25 foot tape measures to get my bearings, and layed down one row in each dimension, using a rubber hammer to set each tile into the sand. I then purchased a bag of Polymetric Sand which has a polymer in it that sets up hard and waterproof in the joints. I swept it into the joints then carefully and slowly over the course of 30 minutes misted the material with a hose. It was crucial not to over water it, so samples had to be dug out of the joints to see when full penetration had occurred. 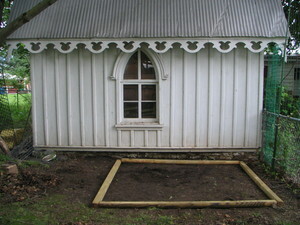 To assure you that this project wasn't perfect despite the fine tale I have told, I failed to note the position of the drip edge of the Gothic, which is perfectly aimed at the last joint line on the patio, and the next rainfall gleefully washed out some of the sand ... I have since reset the sand twice, and it should now be well set and hard, and should endure what the roof puts out on it! I may still divert it, but for the time being we have a lovely new sitting area in the yard. Enjoy!